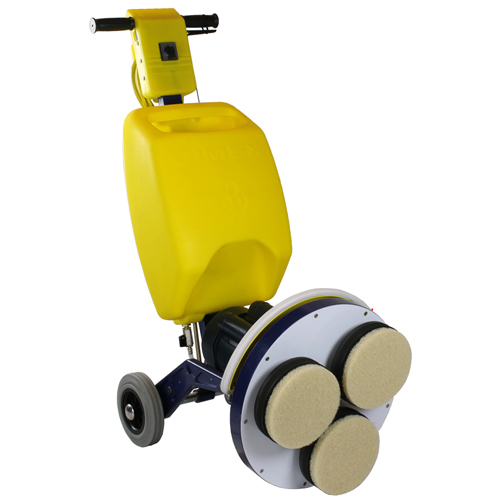 The Cimex Carpet Machine is designed for low moisture carpet encapsulation cleaning that uses a polymer solution to encapsulate dirt particles. This machine uses low moisture that causes less water usage while still allowing for optimal performance; resulting in reducing water waste and saving money. People often experience sticky carpets after using a regular carpet cleaner. This is due to the excess soap detergents that the extractor leaves behind. When this happens, it becomes even more easy for dirt to attach to the carpet; creating an even bigger mess than before. Encapsulation from the Cimex Carpet cleaner creates a process in which the dirt encompasses a hard shell, making it easy to vacuum up. Once the dust bag is full, you can discard. This is a more effective and environmentally friendly way to clean, compared to other carpet cleaners.